Barco has launched wePresent WiPG-1600W, the latest iteration of its cutting-edge cross-platform BYOD presentation solution. Aimed at enabling a more seamless and interactive experience for classrooms, lecture halls, and huddle spaces, the wePresent WiPG-1600W builds on the best features of its preceding models with greater networking flexibility. The launch once again underlines Barco’s technological and market leadership in the collaboration and networking space, and highlights how it is redefining traditional meeting spaces with its cutting-edge solutions. wePresent WiPG-1600W enables users to intuitively write and draw on the interactive touch display connected to wePresent. It integrates with touchscreen displays and smartboards to allow wireless control of any user device. Interactive touch displays allow users to remotely access features such as On Screen Annotation. With interactive whiteboards becoming more available and widely used in different educational institutions, users can have control of wireless presentation which is a must-have requirement in today’s digital classrooms. Armed with multiple network access solutions such as wired LAN, wireless LAN, and wired LAN + wireless LAN, the wePresent WiPG-1600W allows users to switch between various networking solutions to meet the specific presentation requirements for different use-cases. It also comes equipped with several interactive features such as USB media/document player, on-board video player, on-screen annotation, and interactive whiteboard, which enable seamless sharing of information over a networked environment with just a few clicks. The solution can also auto detect HDMI resolution and allows presenters to share content on a display with wePresent while viewing different content, making for a more personalized and seamless experience. Moreover, it has the capability to mirror Chromebooks as well as iOS devices through Apple AirPlay. 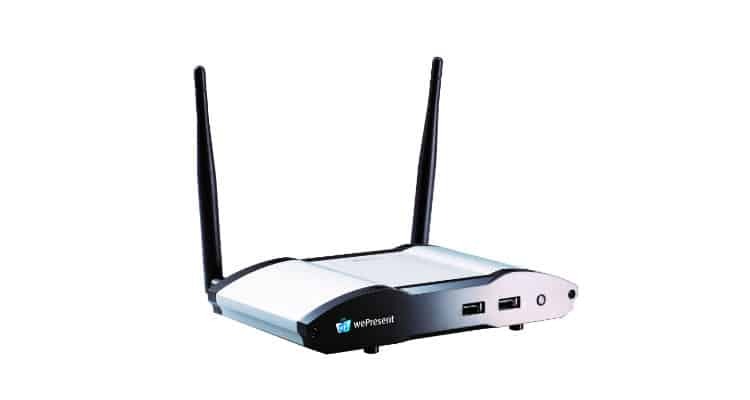 The Power over Ethernet (POE) feature further allows the wePresent WiPG-1600W to ditch the power cord. This cross-functional approach makes the WiPG-1600W one of the most comprehensive, technologically-advanced, and customizable collaboration solution for learning spaces such as college lecture halls, keynote speeches, and student huddles. The WiPG-1600W features a 64-user capacity with moderator control and advanced security, including enterprise-level encryption, gatekeeper settings, and 4-digit access codes. Multiuser queues allow moderators to manage how connected participants can share their content, while 1 to Many Distribution allows presentations to be displayed simultaneously to multiple network-connected wePresents in larger groups. USB Guest Access allows guest presenters to quickly connect and display their device in as little as 5 seconds, while guest users can also download a simple executable file and connect straight to the specific wePresent, without installing the software on their device. This provides moderators complete control over their networked environments and allows them to keep it secure, focused, and productive.